Named in the top 10 best Houston apartments by the Houston Chronicle and Rent Cafe, Camden Greenway has it all – luxury apartments, the perfect location in the Greenway Plaza area, excellent customer service and a true sense of community. Tucked away but still inside The Loop , Camden Greenway offers pet-friendly one and two bedroom apartment homes right in the middle of the coveted Upper Kirby district. Say goodbye to long commutes with direct access to US-59, Greenway Plaza business district and the 610 loop. From Downtown, to the Washington Corridor, Uptown to the Galleria or the Texas Medical Center – you can get anywhere in 15 minutes! For your apartment home, we have the perfect layout to meet your budget, needs and wants. Choose from seven spacious floor plans complete with stainless appliances, full-size washers and dryers, luxurious garden tubs and huge walk-in closets. Each Upper Kirby apartment feels like a luxury home with granite countertops, custom espresso cabinetry and beautiful wood-style flooring. Additional conveniences include covered and direct access parking, onsite storage, and at-your-door trash pick-up and recycling. View our available floor plans here. 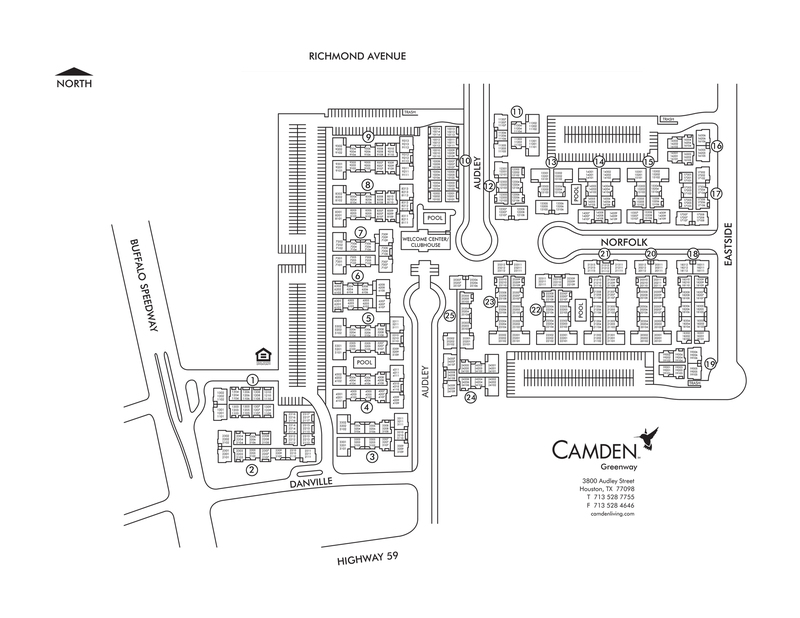 Camden Greenway also offers an oasis of amenities to relax after a long day or revitalize for a night in. Take a swim in one of the four resort-style pools or host a picnic at one of the alfresco dining areas complete with grills. Stay fit in the 24-hour, two-level, high-endurance fitness center with complimentary fitness classes with friends and neighbors - the first floor is a weight room with a full set free weights and you can find the cardio room upstairs with treadmills, spin bikes and more. In the mood to entertain? You’ll love the 24-hour social lounge complete with kitchen, gourmet coffee bar, Billiards, poker tables, Wi-Fi and TV. The possibilities are endless! At Camden Greenway, pets are family too! We love our four-legged residents and they love living steps away from the newly renovated Levy Park. Take advantage of having an event lawn, garden space, dog park, native landscaping, interactive water features, and so much more – right in your own backyard. Plus, within Camden Greenway’s gates your pooch will enjoy walking in the peaceful gardens surrounded by historic oak trees. You’re also a short drive (or walk) from plenty of grocery options. A few of our favorite destinations include: HEB, Whole Foods Market, Costco, Trader Joe’s and Urban Harvest Farmer’s Market. There are also several delicious, unique restaurants within walking distance including El Tiempo Cantina, BB’s Café, Sonoma Wine Bar, Queen Vic Pub & Kitchen and Kirby Ice House. Time to shop or enjoy the great outdoors? Head down to pedestrian-friendly Rice Village or Upper Kirby, or go for a run at nearby Memorial Park. Residents also receive a technology package included in the total monthly rent with a savings of up to 56% off retail. This money-saving package includes high-speed internet up to 150 Mbps and over 140 digital video channels plus HBO through Xfinity. Use the Xfinity Go app on your smartphone or tablet to access your digital video anywhere. Come home to Camden Greenway. View our available apartments today!